The Dell SE198WFP comes in silver-black colour. The panel has nice round edges and has 5 control buttons on the front. The power button has inbuilt indicator light. The indicator glows in blue colour when the display is active and orange when the display is in standby mode. The display stand is black in colour and looks good with curvy corners. The stand can be attached and detached easily on the back with one press of a button. The stand has only tilt adjustment i.e. you can only tilt the panel up and down. You cannot adjust the height of the panel as there are no height adjustments. Take this into consideration while buying this monitor. The controls on the front are a little hard to press and make some noise when pressed. This isn’t a big issue unless you like the soft (feather) touch buttons. The main menu has almost all the adjustments one wants in a monitor. Many adjustments work only while connected in VGA mode. The SE198WFP is a 19″ wide screen LCD monitor and has the native resolution of 1440px x 900px. It has pixel pitch of 0.285mm, response rate of 5 milliseconds (ms), brightness of 300 (cd/m2 ), contrast ratio of 1000: 1, maximum sync rate (V x H) of 75 Hz x 83 kHz and has has a viewing angle of 160° / 160°. The monitors comes with built in video modes which can be selected using controls on the front of the monitor. It supports both VGA and DVI-D connections. Moreover, the DVI connector with HDCP (High-Bandwidth Digital Copy Protection) ensures high quality image of protected high-definition content. It doesn’t come with speakers and USB ports which is pretty much de-facto in budget monitors. It also features VESA mounting holes for mounting the monitor on a wall with VESA compliant (100 mm) bracket. The connectors are also well placed, so attaching cables is very easy. The SE198WFP consumes 32 Watts of power in typical scenarios and 75 Watts maximum. It consumes less than 2 Watts while in standby mode. The Dell SE198WFP has excellent colour reproduction and the colours are uniform across the display including the corners. It has some what lesser viewing angle than being claimed by Dell (160° / 160°). Text appears very sharp due to it’s high contrast ratio. It played HD video very well with vibrant colours (compared to others in budget category) and DVD playback was pretty smooth. There was no smearing of colours in games and due to it’s 5 ms response rate we did not come across any clipping even in fast moving scenes. The monitor came with VGA, DVI-D, power cable for the monitor and speaker bar (optional), stand, manual and drivers CD. 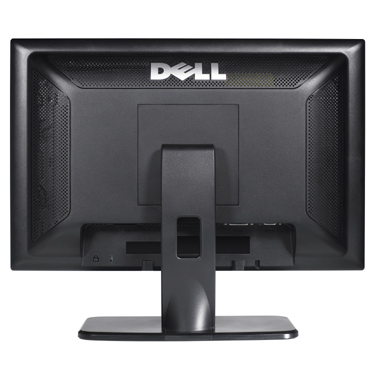 The Dell SE198WFP is a pretty decent product in the budget range of monitors. It beats it’s competitors in product quality in it’s category. It comes with a price tag of Rs. 9700 ($ 119.00) + tax + shipping. You can also buy it from local dealers at a much lesser price which beats most of other brands in pricing too. 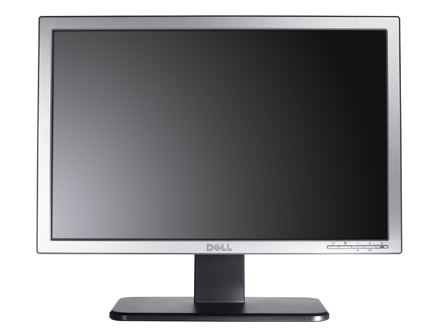 If you want a decent LCD monitor then the Dell SE198WFP is the right choice. 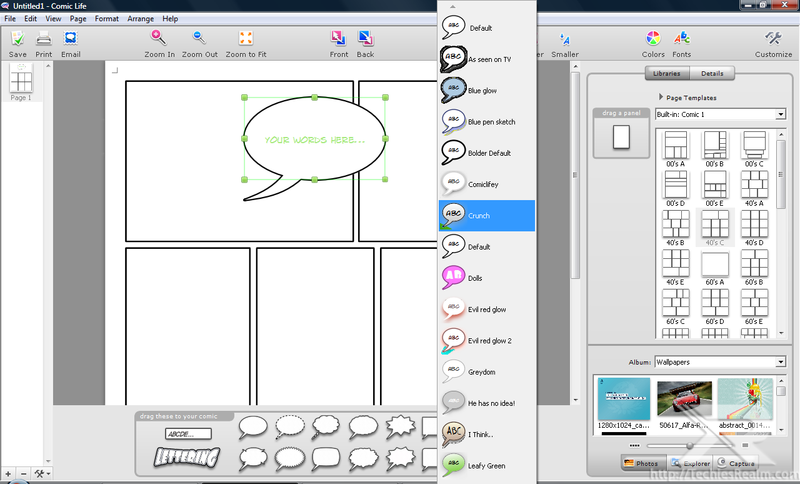 Plasq has been creating some excellent applications for Mac and recently released Comic Life for Windows too. Comic Life is an application for professional comic artists as well as for individuals who want to have some fun by creating comics and albums of photographs of their families and friends. It comes at a price tag of $29.95 for the deluxe version and $24.95 for the standard version. You can also download a free 30 day trial from Plasq’s web site. 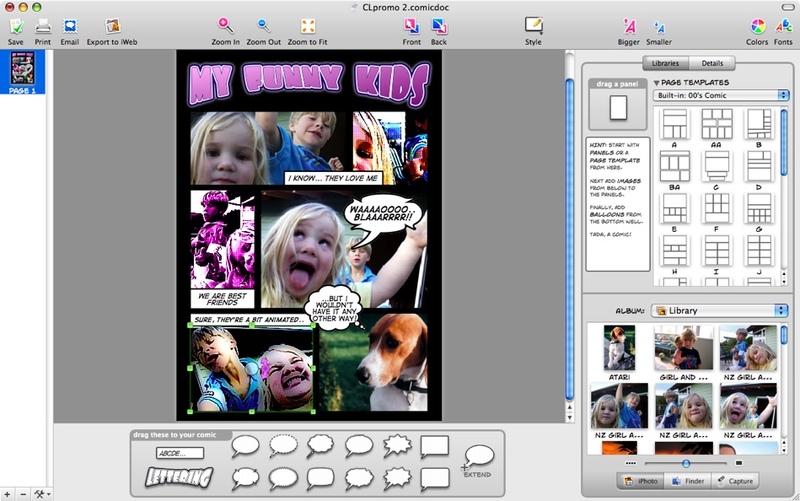 I was impressed by the Mac version of Comic Life before it was released for Windows. Is the Windows version equivalent to the Mac version? Now, let’s get started on it’s review. First of all the Setup icon of Comic Life is simply ugly. The setup icon is the first impression the user makes of an application. The setup too wasn’t any better. Installation took almost a couple of minutes on an AMD X2 3800+ based computer. When launched, a splash screen is displayed before the application appears. The splash screen is quite impressive, I must say. The User Interface (UI) of the application is quite beautiful. It’s similar to the Mac version. The icons are beautiful. The only difference I noticed is that the Windows version doesn’t have smooth Clear-Type fonts on the icon bar and it also had the menu bar. The menu bar takes away a lot of beauty from the application. Colour chooser and font dialog boxes proved to be another eye sore. Plasq should have avoided the menu bar and those dialog boxes could have been made beautiful. 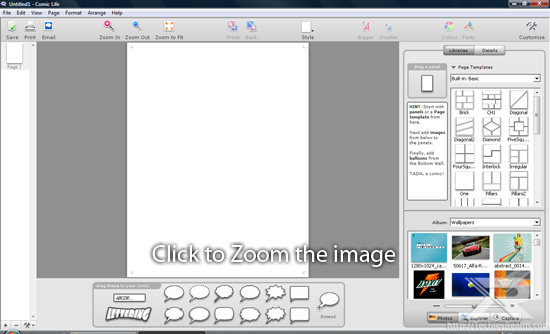 Overall the UI is quite impressive unlike the usual crappy UI software developers dish out to Windows users. Comic Life is very easy to use and understand. It didn’t took me ages to understand how to use this application. You can choose the layout from the given templates and everything works by dragging and dropping on the page. You can easily select background colour from the Style menu. The Style menu also displays styles for the object selected on the page. Colours and fonts can be changed easily using the buttons on the icon bar. You can also customize the icon bar using the customize button. The customize Window is also very beautifully designed. 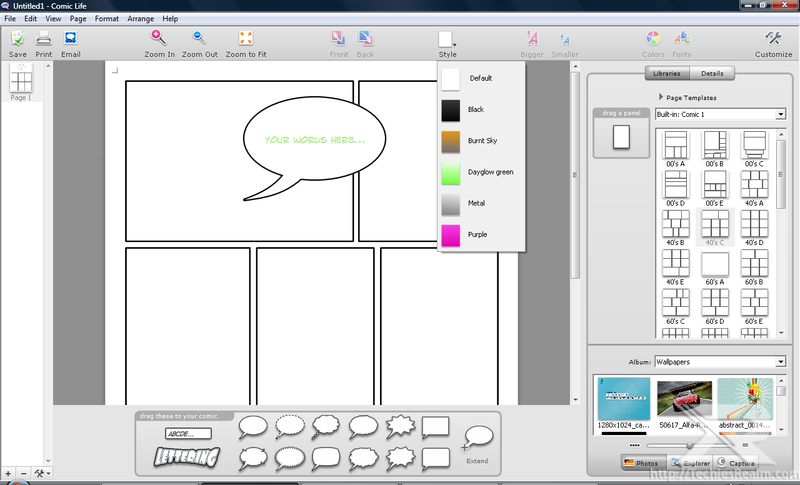 Comic Life for Windows is quite an impressive application. The simplicity and the UI (well most of it!) of this application makes it the best application in this category. Anyone (including myself) can now be a comic artist! I hope Plasq does away with the menu bar and applies changes as suggested above and that will further increase it’s ratings. The price tag is also justified as the application is worth every penny. I give 4/5 to Comic Life. Price- 1700 INR with bill & warranty. Pros- Price, Signal range(in this price range), Looks, Data transfer speed. Cons-The antenna can’t be detached as a result more powerful antenna can’t be used. However you can find various ways to increase the signal range on the internet which I am not going to discuss here. 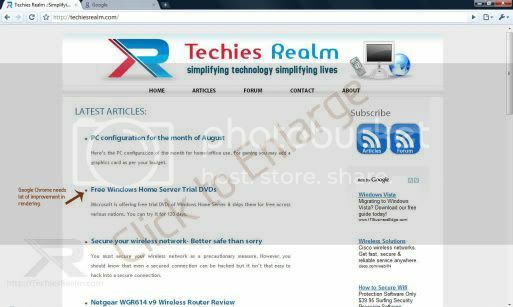 The Netgear WGR614 v9 is a sleek device & the build quality is very good. It beats any other router in looks and boasts of some great features. 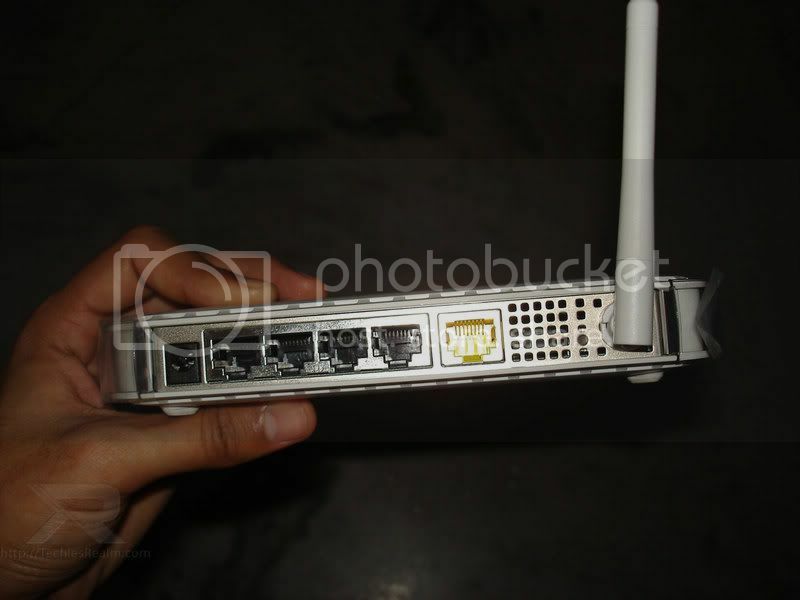 It is a 802.11g compliant device. 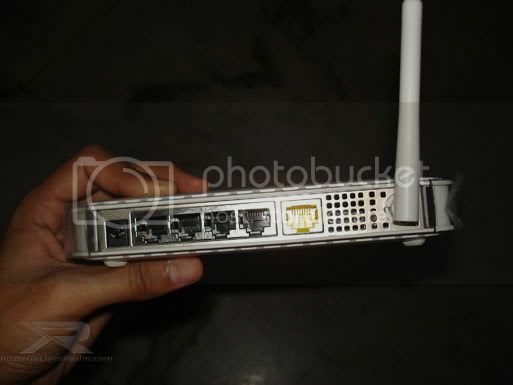 The router has web interface for setting up the Internet/LAN connection. The interface is clean & easy to understand. The device did not heat up & hung up as claimed in some reviews on the internet. In fact it was a little warm even after 24 hours of usage in summers. 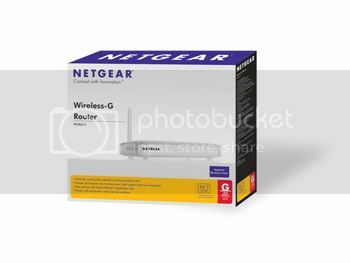 I am totally satisfied with Netgear WGR614 v9 & can’t find any reason to complain. Setting up of my broadband connection was a breeze with the setup wizard. I just had to enter the IP address, Gateway address & DNS addresses & it was ready. The router provides DHCP addressing to the clients which means absolute zero overhead of client configuration. 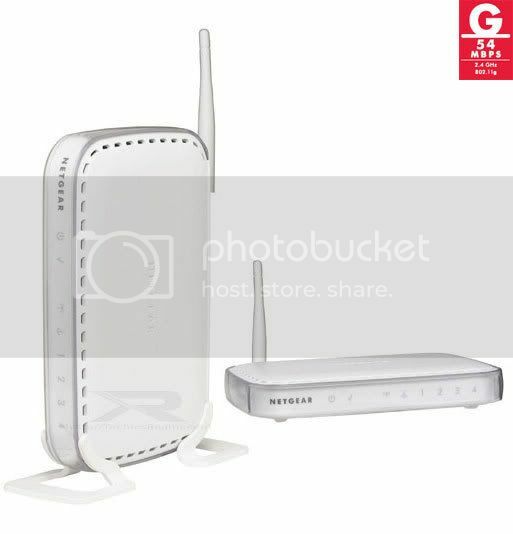 The router has 4 Ethernet ports & supports unlimited wireless connections theoretically. You can view the connected devices in the web interface provided by the router. Port forwarding & triggering, Static routes and UPnP can be defined easily. 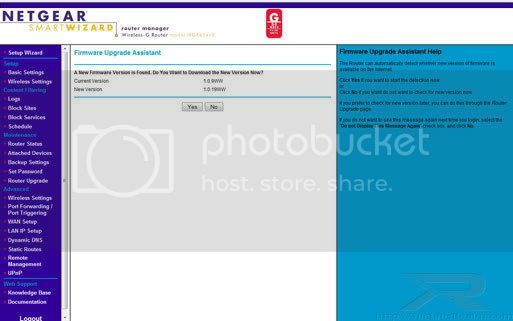 The router automatically checks for firmware updates after the login process and if an update is available a message is displayed to download the new version. You can secure your network with WEP, WPA-PSK and WPA2-PSK encryption technologies. Securing the network was also a breeze. Sites & services can also be blocked and you can schedule the network connectivity too. The wireless signal range of this router is pretty good. It covers every nook & corner of 225 Sq. Yards home. A couple of points in the building had 1-2 bars of signal available but the internet speed did not suffer. The signal was also available across a 30 feet wide road outside the building. It transferred data at the speed of 2.5 – 3 MB/second when the signal meter had 4-5 bars on a Windows Vista based computer. The range & data transfer rate is pretty good considering the price of the router. This morning my Google reader subscriptions pointed me to Goobimama’s Soggy Blog. I was surprised to see a review of something called Google Health by Milind. To be very frank, I expected Google Health to be just another application for writing notes about medicines. But it is another brilliant product by Google. I’ve always had the habit of recording what kinds of medication I’ve taken for any particular ailment of mine, but didn’t really have any organised way of doing it. Then I came across this neat little service from Google, called Health. As you might be able to see, its got provisions for saving your conditions, medications, vaccines and all that. It is pretty neat and the whole thing seems very secure. I must thank Milind for reviewing this wonderful web application by Google. 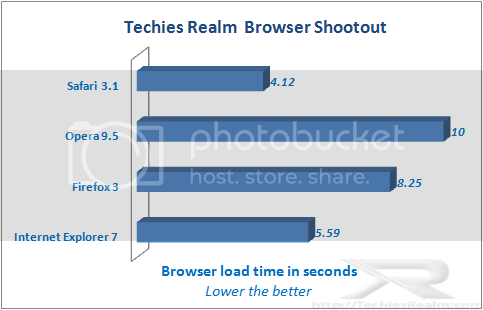 With the release of Opera 9.5 & Firefox 3 in the past few days, the browser war has once again begun. Apple released Safari 3.1 for Windows with big claims which started ‘who’s the fastest’ war & now all three claiming to be the fastest browser. 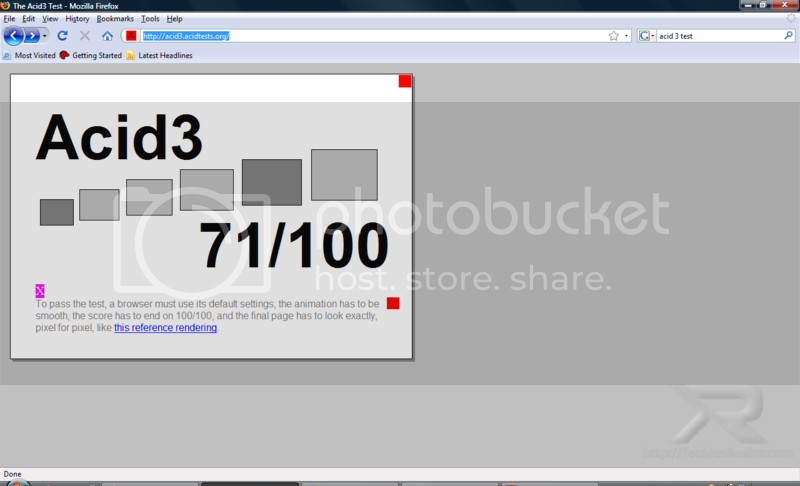 I am going to test Internet Explorer 7 (as Internet Explorer 8 is in beta stage), Firefox 3, Opera 9.5 and Safari 3.1. Internet Explorer 7 loaded pretty fast, second only to Safari 3.1. 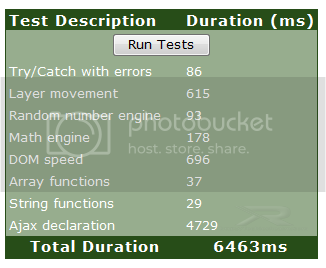 It really lacks web standards support as it could only pass Acid 1 test and failed badly in Acid 2 & Acid 3 tests. There is no thumbnail preview for tabs, no recently closed tabs history & lacks download manager too. As we all know, It is also more prone to malwares & spywares as well. The memory usage was the lowest when one tab was opened, however it was the highest when four websites were opened in four tabs. 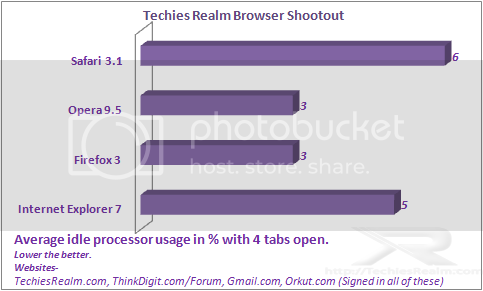 Processor usage, when idle, was 4-7 %, which is also high compared to Opera 9.5 & Firefox 3. 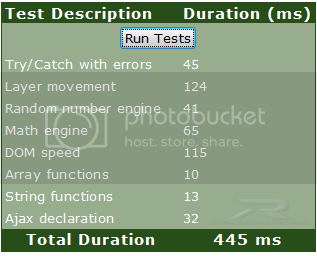 It took more time than Opera 9.5 & Firefox 3 when loading http://techiesrealm.com & fastest while loading http://thinkdigit.com/forum when the cache was empty. 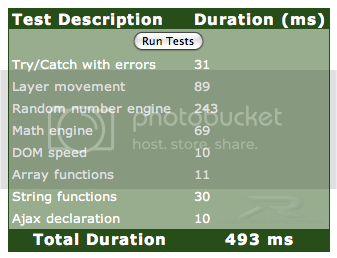 It was slowest, in both, when loading pages which were already in cache. 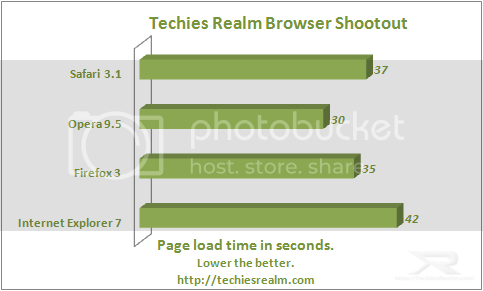 Firefox 3 took more time to load than Internet Explorer. It is very much web standard compliant. 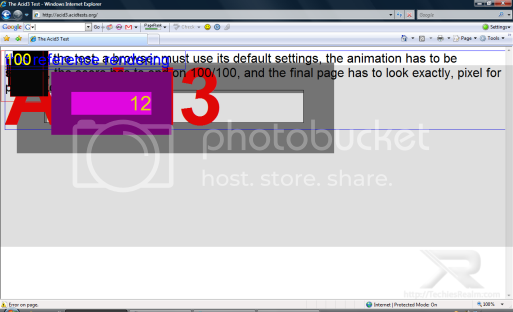 Firefox 3 passed Acid 1 & Acid 2 test but failed in Acid 3 test. 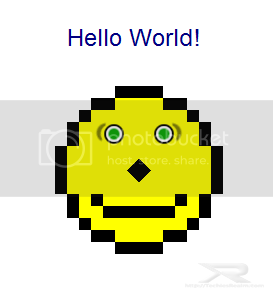 However the results of Acid 3 test were pretty much better than Internet Explorer 7. Like Internet Explorer 7, Firefox 3 has no thumbnail previews for open tabs. It lists recently closed tabs which can be very helpful if you accidentally close a tab. Firefox 3 also has a decent download manager which supports pausing of downloads, not to mention the huge library of addons. 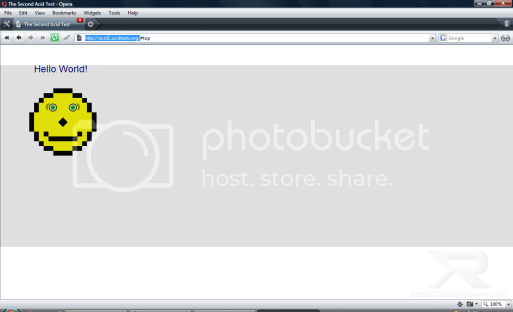 Firefox has improved security in this version & the platform native user interface is one of the best things in Firefox 3. The memory usage was a little bit more than Internet Explorer 7 when one tab was opened however it was lowest amongst all when websites in four tabs were opened. Processor usage when idle was 2-5%, which is the lowest in all the browsers. 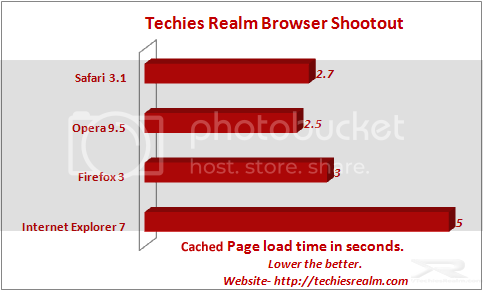 It was second to Opera 9.5 while loading http://techiesrealm.com & was second to Internet Explorer while loading http://thinkdigit.com/forum when the cache was empty. 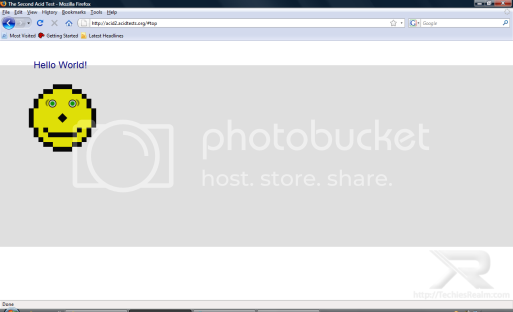 It was second to Opera & almost matched Safari while loading pages which were already in cache. 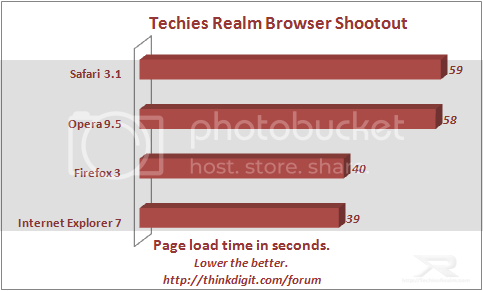 Opera 9.5 took the highest time to load compared to all other browsers. 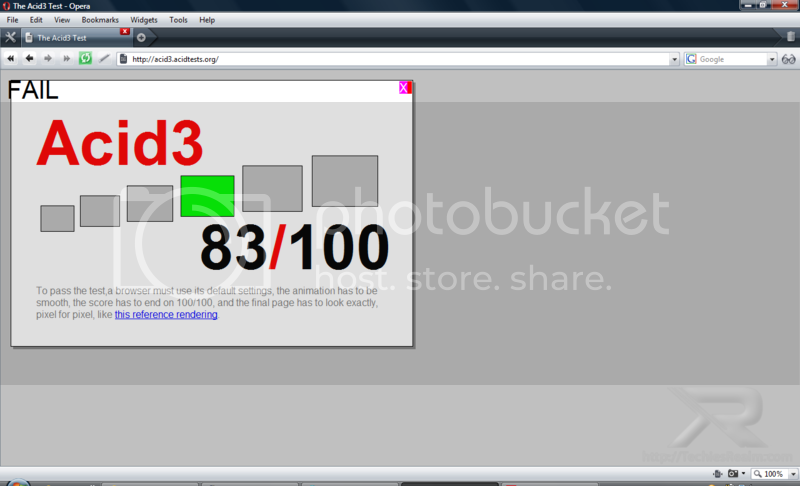 Opera 9.5, like Firefox 3, has improved on web standards front. It passed Acid 1 & Acid 2 tests but failed in Acid 3 test. However Opera 9.5 scored highest in Acid 3 test. Unlike its counterparts, Opera 9.5 shows thumbnail previews for all open tabs & like Firefox 3 it provides a list of recently closed tabs. 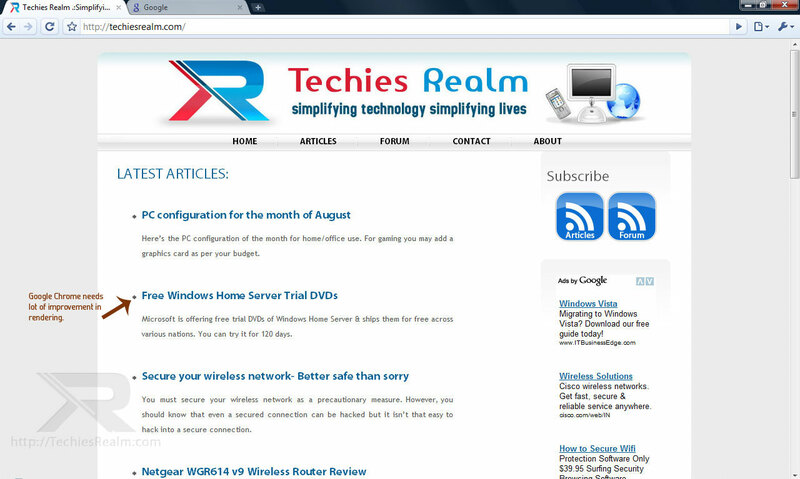 The placement of the recently closed button is next to address bar, which is better than Firefox 3. Firefox 3 lists recently closed tabs in History menu. Opera 9.5 has the best download manager which supports pausing, resuming of downloads. You can also enter address directly in Transfers window to start downloading. This version of Opera has some problems with buttons on webpages. The size of the button appears smaller than the text written on it. Opera 9.5 used more memory than Firefox but lesser than Internet Explorer 7 & Safari 3.1. The processor usage, when idle, was 2-5 %, which is the lowest & is same with Firefox 3. It was the fastest while loading http://techiesrealm.com & almost matched Safari as the slowest browser while loading http://thinkdigit.com/forumwhen the cache was empty. Opera 9.5 was blazing fast when loading pages which were already in cache. Safari 3.1 was the fastest while loading itself. Safari 3.1’s web standards support is similar to Opera 9.5 & Firefox 3. It passed Acid 1, Acid 2 test & failed in Acid 3 test. 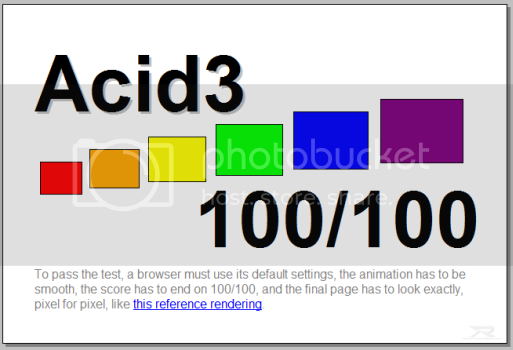 Acid 3 test score was a little better than Firefox 3. Safari 3.1, like Internet Explorer 7 & Firefox 3, doesn’t show preview thumbnails for open tabs. It also has no recently closed tabs feature. The download manager is a decent one. The user interface is pretty much cool with the bluish buttons & scroll bars. 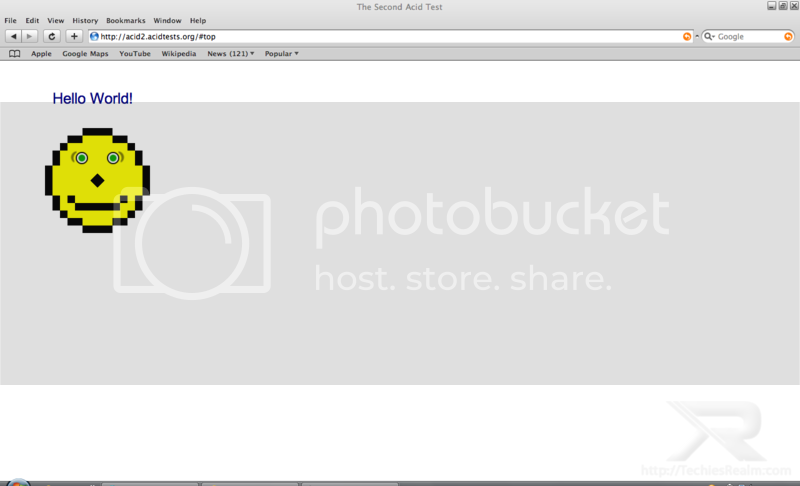 However some some displays do not properly display text in Safari 3.1 as it appears smudged. Safari took a lot of memory as compared to its counterparts & was less than only Internet Explorer 7. The processor usage, when idle, was the highest. 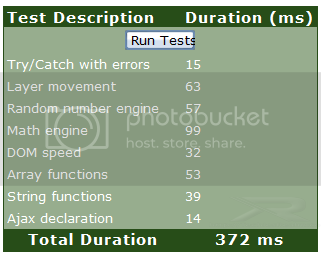 It was second last while loading http://techiesrealm.com & was the slowest browser while loading http://thinkdigit.com/forum when the cache was empty. There was not much time difference between Safari 3.1 & Opera 9.5 when loading pages which were already in cache. 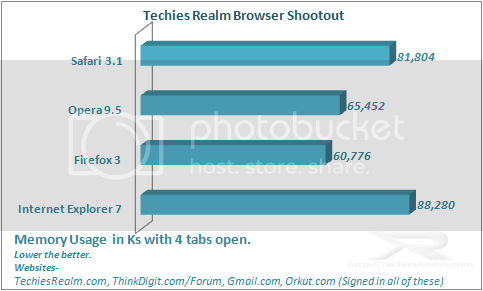 These graphs prove that it is a tough fight between Firefox 3, Opera 9.5 & Safari 3.1. Internet Explorer 7 is a clear loser in terms of features & web standards. I really hope Internet Explorer 8 will catch up with the rest three. Now, for the winner title I’ll have to admit it’s a tie between Firefox 3 & Opera 9.5. They’ll have to share the crown. 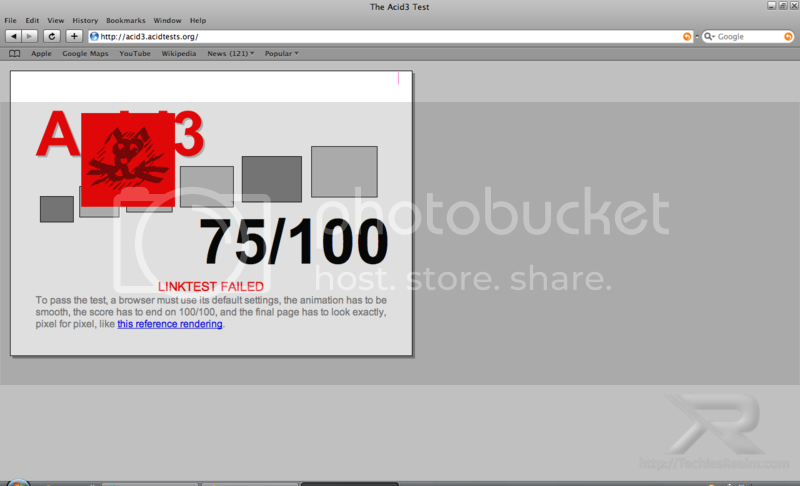 As far as Safari 3.1 is concerned, I must say it is not a loser. It gave a very tough fight to these two & lost out in memory & font display departments although the overall difference is not huge.